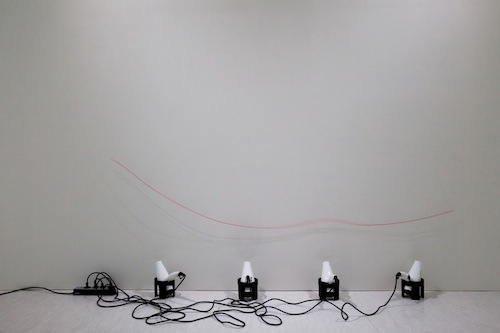 Antoine Terrieux and Camille Vacher, En Plein Vol—Fil Rouge (During the Flight—Red String), 2014, mixed media, dimensions variable. Watching Peter Fischli and David Weiss’s film The Way Things Go, 1987, it seems like a prescient indicator of the twenty-first century’s concern with speculative realism. Inanimate objects seem to be magically endowed with human agency in the film, their movements and interactions setting off a chain reaction: A tire rolls over a series of seesaw ramps, eventually bumping into a miniature car carrying a lit candle, which is propelled forward into a set of firecrackers, which then explode, lighting a nearby fuse, and flames spit forward, igniting a patch of oil . . . and so on for half an hour. The Fischli and Weiss piece is the departure point for this group exhibition of contemporary artists who assign animism to things. The title 000 illustrates the shape of Žilvinas Kempinas’s 2006 work that consists of three circles of magnetic tape being blown against the wall by three industrial-strength fans; a work of modernist sculpture that dances—Calder with electricity! Nils Völker’s Twelve, 2016, is a series of inhaling and exhaling canvas bags and calls to mind the work of Krištof Kintera, an artist who could have also been included here but, frustratingly enough, wasn’t. Elsewhere, Eight Drunken Immortals, 2012, by Ruey-Shiann Shyu, utilizes mechanized metal wheels to make a large-scale ink painting. But the biggest highlight is probably Antoine Terrieux and Camille Vacher’s recurring installations from the 2014 “En Plein Vol (During the Flight)” series starring blow-dryers and assorted small objects, and their dazzling gestures. Positioned on the floor and aimed upward, the dryers revolve a paper airplane around in a perfect circle. A long red thread is jolted to and fro, yet it never escapes from the source of the blow. Terrieux and Vacher demonstrate that in some cases, the foundation of great art is just a bunch of hot air.